For us the magic of stepping on board the truly glamorous Orient Express began when we arrived at London Victoria station. Wide-eyed and filled with excitement we headed towards platform two, where the train boards and departs. To aid us and indeed all passengers of the Orient Express, at the often hectic Victoria Station, are large brown boards showing signs with an unspoken aura to them, clearly depicting the 'Venice-Simplon Orient Express' entrance. We feel this is an indication of just how captivating, and indeed desirable a trip on the Orient Express is. In our experience, it was not uncommon for glances or picture opportunities by these signs; yet for us it only confirmed that this experience was going to be truly magical on this special Sunday day trip. The Orient Express has its very own check in, with a truly buzzing atmosphere generated by lavishly dressed fellow passengers and accommodating staff. We made our way towards the front desk with our reservations in hand for Afternoon Tea on The British Pullman, via a short stop at Folkestone in Kent. We were politely and smoothly checked in, before being directed towards the complementary tea and coffee stand set up beside the entrance. We waited for just shy of ten minutes for the train to arrive, during this time frame our excitement was reaching unprecedented heights as we awaited our first glance of this iconic train. The arrival of the train pulling into the station was verbally announced, and it was at this moment we caught our first glance of the gleaming amber and cream carriages. As we proceeded down the platform we passed by different carriages proudly displaying their respective names. It is worth noting that each of the eleven carriages has its own history, with a truly unique story yielding a delightful charm to each carriage. 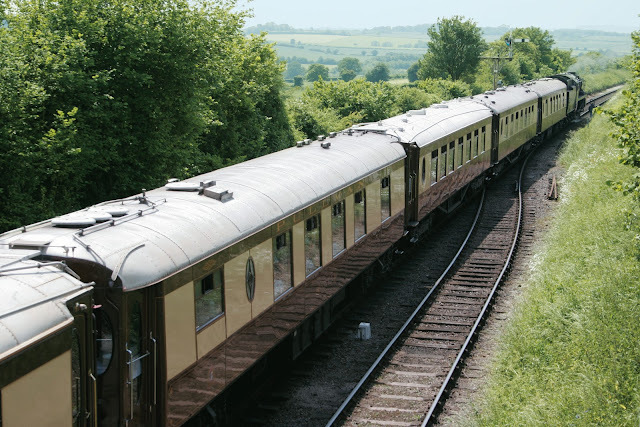 Our carriage named 'Lucille' has it’s origins in 1928 having been built as a first class parlour car and as time progressed ran in the Bournemouth Belle. For those of you who are interested in more information on the carriages you will be delighted to know that on board is provided a booklet with information on each carriage. As we boarded the carriage we were warmly welcomed on board; the customer service was outstanding from the onset as we were shown to our seats. The interior to the carriage is a beautiful blend of vintage glamour, showcasing veneered panels with exotic art deco marquetry. Our table from which we would be based for the majority of our Orient Express experience was perfectly presented. The table had a fitted, crisp clean white linen table cloth, with heritage silverware cutlery and exquisite chinaware. The table also included two bevelled glasses with the Venice Simplon monogram adding that extra special touch to the occasion. The head of the table has both fresh flowers and a statement Art Nouveau lamp, which we found beneficial when going through tunnels on our travels. The table is spacious yet intimate with deep, velvet armchairs to ensure your comfort throughout the journey. Before leaving London, we were introduced to the individual stewards that would be taking care of us throughout our journey. 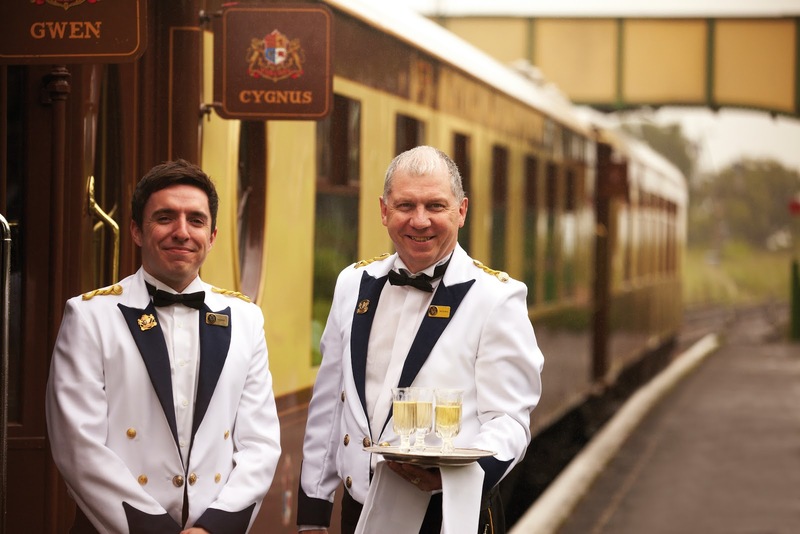 We would like to acknowledge three members of the team that really went the extra mile to ensure that our experience on the Orient Express will always hold fond, everlasting memories for us: Daniel, Mitchell and Jeff the train manager. Their passion and enthusiasm for their jobs is truly admirable. As we pulled away from London and begun our journey to Folkestone we were each presented with a signature Bellini. This was a perfect choice of drink to indulge in whilst we took in the sights from our window. It was at this stage we were introduced to the train manager who greets each and every guest on board adding that unique, yet valued personalised touch. Prior to our menu being served, the stewards laid out our napkins and asked if we had any dietary requirements, the Orient Express is able to cater for an extensive range of requirements. It is worth mentioning that on the Orient Express individual care is of great importance. In some cases Jonathan Kohout, the head chef, will create a whole new menu to ensure full satisfaction for every guest. In a suitable time frame we were served our first course of brunch; a fresh fruit cocktail with a choice of indulgent yoghurt, if desired. The fresh fruit cocktail was arguably one of the best we have enjoyed, with fruit that was wholesome and bursting with flavour. There was also great variety in the fruit including grapes, lychees, grapefruit, watermelon and mandarin. The next serving within the brunch menu was scrambled eggs with chives and smoked salmon (from Inverawe Smokehouse, producers of the finest smoked salmon in Scotland), served on a warm crumpet with pan fried mushrooms. We really liked how the brunch was served. It began with a warmed plate, before each individual item was hand served, allowing guests to state their preferences. The food was divine; with a sufficient amount to leave you deliciously content. As we began to edge closer to Folkestone we were served our final course within our brunch menu, warm banana and walnut cake with whipped cream. The food quality served on board is exceptional, which resulted in some of the best meals we have indulged in. We discovered that on the Orient Express there is a heavy emphasis on creating a timeless, truly British menu. All produce used on board is linked to the locations that are passed throughout the journey. This also includes selecting local produce and looking within the markets to see which products are having a good year and only selecting the very best available. When we arrived at our destination of Folkestone, we were greeted by a brass band, to our astonishment and enjoyment, joyfully playing on the platform. We really enjoyed the unique combination of novelty and the bygone era touch at this reception. It was at this stage of our journey that the passengers on the Orient Express divided. Those that would be traveling to Paris and Venice boarded on a separate coach, whilst those on the day trip boarded another. Stepping on board we were greeted warmly by Anne, who provided us with some details of the history of Folkestone and a much needed map. For those who are not aware of Folkestone it is a quaint seaside town with an interesting history. The town, in its past, has welcomed Charles Dickens, the English writer, has been a popular holiday destination and rather ironically, in light of its seaside setting and closeness to the European mainland, was at one stage a location were evacuees were sent during world war two. The coach stopped at Folkestone for a short while, allowing us plenty of time to enjoy the seaside air and surroundings. When we returned to the station the band resumed playing as we boarded the Orient Express, for the final time, for our return journey and the delights to come of the British afternoon tea, we were about to enjoy. Returning to our carriage, we found our table had been perfectly re-made, in preparation. The afternoon tea began with us selecting our teas, which we elected to enjoy from the onset. On board the Orient Express Tregithnan tea is served. Tregithnan is the only producer growing tea in England, and subsequently has an impressive international reputation. The selection was neat, ranging from Black teas such as the ‘Classic tea’ which, as to be expected from the name, is bold and full bodied in taste to Herbal teas including ‘Peppermint tea’ which has a very strong, fresh aroma. The two teas on the list in their respected categories that we greatly enjoyed, throughout our afternoon tea were as follows. The first a black tea named ‘Afternoon Tea’ which is a light and exotic blend of hand-plucked leaves from the Cornish estate combined with the finest tea from Darjeeling. The second an herbal tea by the name of ‘Manuka Tea’ which comes from the only Mauka tree outside New Zealand, this tea has exotic notes with an intense aftertaste. On the Orient Express, afternoon tea is served in the following order; a selection of freshly made sandwiches, freshly baked scones and finally a selection of afternoon tea pastries. Before this mouth watering selection every guest is treated further with a glass of 2009 Balfour Brut Rose, English sparking wine. This wine hails from the enchanting ‘Hush Heath Estate’ in Kent and has won numerous awards to date including receiving a gold medal in the 2012 ‘Decanter World Wine Awards’. We can personally testify that the taste of this wine is heavenly, and an excellent partner for your afternoon tea. Sitting back, enjoying both the views from our window and charismatic surroundings we were served our selection of sandwiches. The Sandwiches keeping in-line with the truly British afternoon tea, consisted of the following classics; chicken and grain mustard mayonnaise, Scottish smoked salmon with black pepper and lemon, ham and English mustard, egg mayonnaise and cress and chive cream cheese and cucumber. Maintaining the very high standards on the Orient Express that we had begun to become accustomed to, the quality of the food was outstanding, with a flawless taste. It is very difficult for us to name a favourite, and we promise, whole heartily, you will too! Within a suitable time frame, and between a tea top up we were served our freshly baked warm scones. The scones were fantastic, and perfectly complimented with the Cornish cream and preserves (strawberry for us, of course!). The final serving of our afternoon tea, was undeniably our favourite. The selection included seasonal fruit tart, layered chocolate cake, Eton mess, pistachio and walnut carrot cake, blueberry mouse in an almond sponge and chocolate and coffee macaroons to finish. Our favourites in this selection are the Eton mess and chocolate and coffee macaroons. The Eton mess with every spoonful, reminded you of the summer months with delicate notes of summer fruits were as the macaroons were so flavoursome you could not help but smile widely in delight. For us, the combination of our surroundings being aboard the Orient Express, diligent staff and heavenly food made this our favourite afternoon tea to date. As we returned to London Victoria our hearts sank at the thought of having to leave the Orient Express, because our time aboard had been so magical. We cannot recommend a trip on the Orient Express enough. In our eyes this would be an unforgettable day trip, birthday celebration or anniversary. 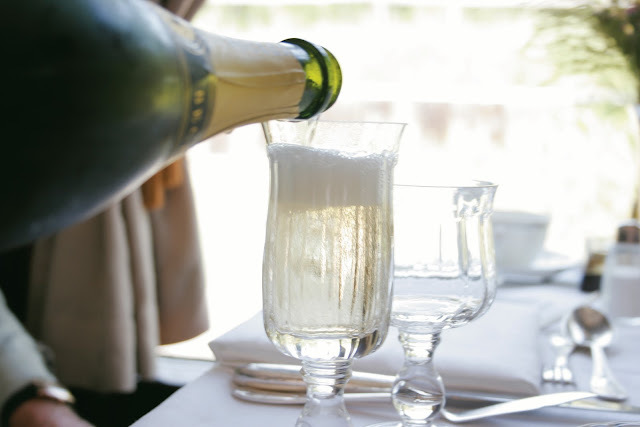 It is no surprise to us, having experienced the Orient Express first hand that its reputation is so highly regarded. I'm so going to suggest this to my hubby about NOW. I've wanted to do it for ages and it looks and sounds fab. This looks fabulous, I would love to on the Orient Express one day.